The Acer Chromebook R 11 C738T sports the latest MIMO 802.11ac wireless technology, boasting very fast wireless connection speeds and longer signal ranges. It is just 19.2 mm thin and weighs less than a mere 1.6 kg, making it extremely light and portable, and it features an HDR webcam that supports Dynamic Range imaging. Judges appreciated its solid build, great touch screen, and its speed and responsiveness when compared to other Chromebooks. Another winner from Acer, this laptop features Acer LiquidLoop cooling that helps maintain CPU performance without whining fan noise, a USB 3.1 Type C port, 2.50 GHz Intel Core i7 Processor and 8 GB of memory, along with a 512 GB solid state drive capacity keyboard backlight, and a responsive pen. Judges liked the laptop’s form factor and approved of its adjustable keyboard, as well as its overall great performance for its price point. Aristo Educational Press Ltd. has added a geography program to their platform that provides students the opportunity to learn about the land and the planet through AR and VR technology, while also providing videos to help expand the experience. The judges were amazed by the unique learning experiences it provided, particularly how it also helped students think about modern world issues like pollution and the changing of landscapes. This program is primarily based in China. AVer’s F50-8M document camera features 8 megapixels and offers several tools in one portable package: a scanner, web-video digital camera, lined-graph plain paper, and “best-in-class” image clarity. It is able to zero in on the smallest details and reach students even in the back of the class with crisp text, bright images, and vivid colors. It can display video quality in 60 fps. Judges found its variety of connectivity options, software features, and portability impressive. Another product from AVer, the AVer S42i+ Cart is a multipurpose charging cart with a fully adjustable design that offers a more intuitive system. It can manage and charge up to 42 Chromebooks, laptops, and tablet devices, and it knows when to stop charging, sending more power to external outlets and allowing use for additional technology. Judges liked its intelligent charging feature, pull-out drawers and cable management, and the ease of the cart’s movement. Blackboard released a mobile personalized learning management system called Blackboard Classroom. K-12 oriented, it allows teachers to automate elements of their class to differentiate instruction, improve student engagement, and increase teacher efficiency. Judges liked its ability to be accessed offline for teachers and students without wifi at home, the fact that teachers are able to edit and change anything from their own dashboards, and the ease it grants teachers when they need to plan lessons or assessments. The Califone 1534BK Headphone is made for use with all varieties of computers and mobile devices. It’s ideal for personalized digital learning, featuring rugged ABS plastic headstrap and earcups that resist breakage in high-use situations, replaceable padded leatherette ear cushions, and noise-reducing earcups. Judges appreciated its sound quality, comfort, and compatibility with multiple devices, as well as its noise-cancelling qualities. Another award-winning product from Califone, the Califone PA11 wireless PA system is easy to use and can be used for outdoor or indoor events for audiences up to 150 people. It is portable and lightweight, weighing only 5 lbs., has a built-in carrying handle, and has a 100’ wireless range from transmitter to PA. Judges liked its variety of inputs, long battery life, and its wide wireless range being able to work even through walls. Another new product from Califone, the PowerPro PA920 is a Bluetooth speaker that is a self-contained sound system with two built-in wireless mic receivers, a CD/USB media player, and Bluetooth compatibility for wireless connection to Bluetooth devices. A single unit can cover crowds up to 1000 people and more. Judges loved its great room-filling sound, its variety of sound options, and the speaker’s wired and wireless capability, as well as its six-hour battery life. The Casio XJUT351WN has a good feature set, reasonably loud built-in speakers, good networking support, low maintenance, and great picture quality. Claiming 3,500 lumens, this is ideal for conference rooms and classrooms with quite a bit of ambient light, or moderate light and very large screens. Judges liked its variety of ports for connectivity, large projected image size that is clear from even short distances, and that it is lamp-free, cool, and quiet. CatchOn is a dashboard that helps educators streamline all their data into one place, including all their apps. Educators can use it to analyze trends over time concerning the apps, gaps in usage across grade levels, and also receive such data in reports that help administrators quantify their investments in the technology their campuses are using. Judges liked its ability to provide useful information that can help schools save money through insightful data. ClassLink Analytics is a custom dashboard for all connected educational apps, showing a summary of logins, users, and apps. Educators can view reports and see which apps are strongest or most frequently used, which ones are underutilized, and more, to aid in better educational use. Judges liked that its graphs were easy to read, that the data was offered in real time, and that it helped leadership teams make informed decisions about software purchases. The BrightLink 697Ui touch-enabled, wireless ultra-short-throw interactive display delivers supersize full HD WUXGA images up to 100 and features 4,400 lumens of color and white brightness, turning almost any wall or existing whiteboard into a collaborative interactive workspace. Judges liked its excellent image and quality size, multi-user and touch screen capabilities, and its options for multiple devices and projectors to interact on the same image. Designed for today’s BYOD classroom, the PowerLite 685W WXGA 3LCD presentation display shows 100” images from just 11” away for optimal visibility. Delivering 3,500 lumens of color and white brightness, the 685W ensures stimulating presentations. Judges favored its great image quality, multi-device connectivity, and its image size option for a variety of rooms. EquatIO is a Web-based program that lets everyone create mathematical equations, formulas, Desmos graphs, and more on their computer or Chromebook. Judges liked that it takes away the preliminary task of having to convert the equation to digital form to create tests, formulas, and worksheets with clear digital equations. They also liked that it lets students create their own worksheets or answers for homework with this tool, letting them focus on their work. Visible Body’s application, Human Anatomy Atlas, its best-selling human anatomy general reference learning tool used to explore the systems of the human body, is now available in zSpace. Through the power of zSpace immersive virtual reality, students can dissect, manipulate, and explore virtual models of the human anatomy as if they were holding them in their hands. Judges liked its realistic environment, comprehensive content for learning, and its interactivity with the pen and glasses. Canvas by Instructure is a learning management system (LMS) that offers a variety of features such as allowing students to receive notifications about assignments, submit work, and interact with learning materials on their mobile devices. Teachers can grade and assess work, provide feedback to students, and more. Judges liked its neat package, the variety of personalization and collaboration options, the organization of the LMS, and the separate views for teachers, students, and administrators. The Kramer DIP−31M is a 4K@60Hz (4:2:0) automatic switcher for HDMI, VGA, Ethernet, data, and unbalanced audio signals. It provides full-room automation and personalization, including control of lights, screens, shades, and many other exciting options. It supports various modes of input selection and transmits the signal via HDMI cable to a compatible receiver. Judges favored its programmable versatility, audio and video flexibility, as well as its shades and light control. Another winning product from Kramer Electronics, VIA GO gives iOS, Android, Chromebook, PC, and Mac users instant wireless connectivity with advanced presentation capabilities. The product features content streaming with crystal−clear mirrored images and stunning video playback, and includes iOS, Windows, and Android mirroring. Judges liked its very fast setup and good interface, its ability to let multiple users be connected and display, as well as its smooth and clear quality. Relay is a Chromebook filter that keeps Chromebooks safe and CIPA-compliant, while also monitoring social media to keep students safe and on track with a Chromebook filter. It also protects students by stopping inappropriate behavior by identifying and remediating high-risk Web activities using a proprietary flagging algorithm. Judges liked its Web-based access, allowing it to be used anytime, anywhere, its quick and easy deployment, as well as its deep analytics. NUITEQ Lessons Online is an app that connects to a learning ecosystem for content, classroom management, and formative assessment. Lessons Online lets users create, play, grade, and share engaging multi-touch lesson activities on any device anywhere and anytime, enable students to make fun activities they can share, and more. Judges appreciated its visually rich elements, and liked that teachers could use it to create seating charts, lists, and materials to send to students. Stagelight EDU delivers next-generation music education with its in-app lessons and virtual classes – built by teachers for teachers. With royalty-free sounds, customizable lesson plans, state-approved curricula, and more, Stagelight EDU brings first-class music education right to one’s device. Judges liked that it’s a mobile studio, allowing the music to be available all at one place, its simple interface and touch controls, and they also liked its curriculum creator for lesson creation. Ozobot Evo is a classroom-friendly miniature robot that introduces coding concepts through the bot’s block-based programming tool, OzoBlocky. It teaches introductory to advanced programming as students use color-coded markers and paper to draw commands for the bot. Judges liked its easy setup, its variety of social features that appealed to students, and agreed its associated app is great for programming as it allows users to control the bot remotely from any device. PASCO basic circuit modules eliminate wires and allow students to build circuits that end up looking like circuit diagrams, strengthening their conceptual understanding. Each module connects by sliding the tabs into one another and then a jumper clip is inserted, both emphasizing that an electrical connection has been made and allowing for easy measurement anywhere in the circuit. Judges liked that it makes circuit creation easy, as well as its integration with other Pasco products. Another winner from PASCO, the wireless CO2 sensor can measure the concentration of carbon dioxide gas in a closed system or open environment. Students can study core topics (including photosynthesis, respiration, and carbon cycling) with this versatile probe. CO2 data can be logged directly on the device for long-term life science and environmental science studies. Judges liked its Bluetooth connectivity as well as the powerful data-logging/sensor capabilities that define the product. Pearson Connexus is a digital learning solution that offers over 700 proven, standards-based K‑12 courses at a variety of course levels, including Core, Foundations, Advanced, and Credit Recovery. Connexus provides a range of instructional settings, including summer school, online and blended, project-based, and more. Judges favored Connexus for its encouragement of personalized learning, creation of online and blended learning opportunities, and its ability to deploy solutions for a wide range of educational settings. Collisions is a system of interconnected digital chemistry games designed to give middle and high school students a deepened understanding of fundamental chemistry concepts through play. Judges liked its unique focus on teaching chemistry through an interactive game, that each game provided immediate and meaningful feedback, that it featured helpful guides for every game, and that it also featured postgame student quests to extend learning and draw connections between game and classroom. PresenceLearning provides schools with a national network of licensed school psychologists who remotely perform achievement, cognitive and ability, social/emotional/behavioral, and adaptive functioning assessments, live and online via their online psychoeducational assessments program. Judges acknowledged it met the need for quality clinicians in a given district, that it offered a dashboard for clinicians to allow them to access everything immediately, and that it produced quality special education reports and assessments. Promethean’s ActivPanel v5 interactive touch screen display features InGlass Technology that helps offer a naturally smooth writing experience with no script-lag or response delays, an instant whiteboard for free-form writing, converting to text and palm erasing, and more. Judges favored its wired and wireless connectivity, the ability to import a variety of files with its easy-to-use software package, as well as the clarity of the display, its good sound, great graphics, and responsive touch. Raz-Plus offers formative assessments and data-driven reporting to help teachers determine the appropriate reading level for each student, monitor students’ reading growth, and determine future instruction. Judges liked that teachers have access to a variety of report and instructional materials, that it offered personalized instruction for students at different levels, and that it lets teachers set up student packets and send them to their students with books, resources, due dates, and messages. Ruckus Cloud wifi radically simplifies WLAN setup and management. Users can provision, monitor, and troubleshoot their entire wifi network through a single Web dashboard or mobile app. The Ruckus Cloud wifi service works with a wide variety of Ruckus access points (APs). Judges liked its Web controller interface and its accessibility, along with the wifi’s easy setup and configuration of its access points. The Sharp PNC705B AQUOS BOARD interactive display system has the ideal focal point for meetings, presentations, or lessons. Smart and convenient SHARP Pen Software enables real-time information sharing. Thanks to multi-touch sensitivity, up to four people can write freely onscreen at the same time for effective and lively exchanges. Judges appreciated its upgraded functions and lowered price, the range and quality of its speakers, and its ability to be used by multiple users at once. Total Motivation Science for the Next Generation is an award-winning resource that delivers content in print and online formats. Based on the 5E Model of Learning, this curriculum weaves together three-dimensional learning experiences to build knowledge across all curricular areas and support NGSS implementation and STEM practices. Judges liked how it connected science to math and literacy, its variety of assessment items and question formats, its addressing of Common Core State Standards, and its science glossary. Twig Science Reporter is a weekly science news service for a K‑5 classroom that has been created to help teachers connect science lessons with real world news. Twig Science Reporter brings weekly videos and other learning resources together with topical news to inspire school children to become more engaged with scientific inquiry and reasoning. Judges liked that it let teachers subscribe to weekly newsletters, the ease of content coordination, and its alignment with NCSS standards. The Thermal Analysis app from Vernier helps students observe temperature changes on the skin, illustrate convection, track heating due to friction, compare heat conduction in different materials, analyze the transparency of materials in infrared vs. visible light, and much more. Judges liked that it was easy to use and that it let users save their work, and that it allows users to track up to four points to create real-time temperature versus time graphs. The ViewSonic PS750W WXGA projector delivers an interactive solution perfect for any classroom. Featuring an embedded camera, along with an included laser curtain module and wall mount kit, the PS750W offers a low-cost, big-picture alternative to interactive whiteboards and displays. Judges liked that it can be managed remotely, its quick start guide that comes with many illustrations, and that it satisfies the need for a short-throw projector for hard screen or whiteboard use. NovoPro is a system for wireless presentation and collaboration. It’s designed to take business meetings, conferences and corporate presentations to a new level of collaboration and interaction. The presenter can wirelessly interact and share digital content with attendees — and vice versa — via their PCs, tablets, or other portable devices in this modern, smart-meeting environment. Judges preferred it for its easy setup, smooth video streaming, and additional features, including teacher control and file sharing. The STEMscopes PreK-12 curriculum is a comprehensive digital curriculum that helps teachers refine their teaching practices and provides supplemental print and hands-on kits, alongside professional development, all designed to address the Next Generation Science Standards (NGSS). Judges liked the incorporation of traditional quizzes and performance-based assessment tasks, the inquiry-based activities that helped students to think like scientists, and the curriculum’s ability to make connections between science and other disciplines, including mathematics and other science-related fields. 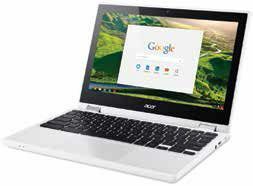 Acer’s newest Chromebook for education customers, the Acer Chromebook 11 N7 (C731), comes with enhanced durability features. In addition, it provides long battery life and a fan-less design, making it an exceptional choice for schools and school districts that want a reliable, powerful, and quiet device for student learning. Judges appreciated its solid build and its good graphics, and praised its overall speed and performance. Alma is a data-driven LMS that provides understandable analytics and graphics to help drive educators’ insight into their schools, classes, and students. It also helps educators implement progressive and traditional instructional practices on their own terms, letting them make informed decisions with the data it provides. Judges liked the infrastructure’s easy navigation, its integration with G Suite (Google Classroom), and also liked the system’s very good data visualization tools. Atomic Learning and Versifit have announced their transformation to one corporate brand: Hoonuit. The rebranding exemplifies the evolution of the companies into a comprehensive suite of data analytics and professional development tools that together provide educators the knowledge and insight to maximize success in the classroom. Judges liked that it offered multiple models of learning for educators, appreciated Hoonuit’s skill in helping teachers build their pedagogical skills, and noted the system’s personalized options as well. Barracuda Backup is a data-protection solution for physical, virtual, and SaaS environments and it makes it easier and more cost-effective for users to protect their data. It offers cloud-based central management for seamless multi-site administration and is available as a virtual appliance that can be deployed without requiring additional hardware. Judges loved the cloud-to-cloud backup capability and appreciated the archiving and filtering capabilities, particularly in their aligning with schools’ safety and security measures. Another winner from Barracuda, Barracuda next-generation firewalls are designed for the cloud era by automatically offloading resource-intensive tasks such as virus and spyware scanning, content filtering, and reporting to the cloud so that network performance is not compromised. The cloud-based Web Security Service provides real-time updates to ensure continuous protection against the latest threats. Judges liked the ability to deploy as a hardware, virtual, or cloud solution and appreciated the advanced threat detection. Yet another winner from Barracuda, The Barracuda Web Security Gateway lets organizations benefit from online applications and tools without exposure to Web-borne malware and viruses, lost user productivity, and misused bandwidth. As a comprehensive solution for Web security and management, it unites award-winning spyware, malware, and virus protection with a powerful policy and reporting engine. Judges commended the Gateway’s full inspection of traffic, including SSL-encrypted and social network scanning. Bloomz is a free app that saves teachers time in all parent communications, while creating a supportive classroom community. Bloomz allows teachers to securely share photos and classroom updates and reach parents instantly through messaging, as well as to coordinate events (like PT conferences) and signups for volunteers. Judges appreciated its ability to help foster community between teachers and parents and its parent feedback option, along with the scheduling flexibility the app provides teachers as well. Built for the Common Core, i-Ready combines a valid, reliable growth measure and individualized instruction in a single online product that saves teachers time at a fraction of the cost of similar products. It features an adaptive diagnostic for reading and mathematics to help pinpoint student needs, downloadable lessons, and more. Judges liked its ease of use, its adaptability, and also liked how its personalized learning helped students participate in lessons at their own level. NEO is an award-winning LMS for use by schools and universities, known for its intuitive user interface, extensive feature set, and strong return on investment. NEO offers a centralized environment for creating classes, organizing learning material, assigning and submitting homework, taking assessments, collaborating with classmates, and analyzing results. Judges liked its user-friendly interface, color-coded data, ease of access, and the dashboard badges students can earn while studying that can serve to further motivate them. Math Techbook is a digital textbook that connects students to math through real-world problems worth solving. Using a balanced approach to instruction, Math Techbook combines conceptual understanding, procedural fluency, and application to help all students develop a long-lasting mastery of mathematics. It features digital videos, data manipulation with digital tools, and more. Judges thought the professional learning support was rich and full of different models, praised its engaging lessons, and also appreciated its user friendliness. Edsby is a comprehensive learning and analytics platform available for K-12 school districts and regional governments. It comes with apps that let parents get real-time views on what’s happening in class, help administrators assess students according to their districts’ policies, terms, and standards, assist students in tracking their assignments and classes while providing helpful reminders, and more. Judges liked its intuitive interface, user-friendly tools, and the brief but engaging tutorials available for all items. Edthena empowers teachers and coaches to collaborate using videos of classroom teaching. Educators can put Edthena’s video technology onto their mobile device with the Edthena app, letting them easily record classroom video, and then automatically upload to Edthena, among other features. Judges ranked it well for its ease in video uploading, its strong support system for users, and for using video and online collaboration to put the entire coaching process in one place. From cloud-based filtering and self-harm alerts to teacher/student chat and screensharing, GoGuardian has everything users need for a successful tech program. Featuring granular filtering, AI-based monitoring, classroom management to aid teachers with classroom-specific tools that assist learning, and theft recovery to help find lost or stolen devices, GoGuardian is a versatile tech system for educators. Judges liked the system for its easy installation and praised its monitoring capabilities. Impero Education Pro is a network management, Internet safety, and classroom management cross-platform software solution that’s simple to install and easy to use. Providing a suite of tools to support and manage technology and users across a school or district, Education Pro gives IT teams complete control of their entire network, featuring power management, print management, license management, remote monitoring, and more. Judges praised it for its ability to empower teachers while protecting students. With a dynamic new design, new features, and expanded coverage, World Religions explores religion and spirituality in an objective manner, from the ceremonies of the first practitioners to the elaborate rituals of today. The new, easy-to-navigate interface puts the information users need front and center. Judges appreciated the wealth of primary sources available to users and the detail behind every religion covered, and praised its teaching of media literacy skills such as evaluating and analyzing primary sources. The Infocus JTouch Whiteboard features a 65-inch, 1080p touch display, a built-in whiteboard that lets users save their work, and contains a multi-point capacitive touch screen with sleek bezel-less design and effortless gestures – just like a phone or tablet. Judges found the JTouch to be a versatile solution for K-12 classrooms to share digital content and lessons on the large, bezel-less, 1080p screen using familiar gestures similar to those used on a phone or tablet. IXL Learning is an educational technology company that delivers an immersive personalized learning experience—for students PreK-12, across all subjects, including math, language arts, science, and social studies. IXL’s content and technology enable fresh, captivating experiences that spark curiosity and build confidence. Judges liked that teachers can use their platform to help them monitor and provide tailored instruction for every student, allowing students to work at their own pace while they practice necessary skills. Itslearning is a K-12 LMS that saves time for administrators, streamlines workflow for teachers, and personalizes instruction for students. The itslearning LMS solution allows districts to truly personalize learning by putting curriculum resources, instructional strategies, objective-based lesson plans, and assessments all in one easy-to-access central location. Judges liked that the program integrates with everything like a student information system and that it allows for personalized instruction, communication, and collaboration. The Kramer VP−796ASV is a universal 4K@60Hz (4:2:0) presentation scaler/switcher for HDMI, DisplayPort, HDBaseT, VGA, composite and DVI−U video signals, analog audio, and H.264 streaming video. Its HQUltraFast technology switches in typically a quarter of a second. It features flexible control options, multiple outputs, and more. Judges loved its fast switching, the 4k ultra-HD support, and its ability to handle both digital and analog input. Lightspeed Systems has announced the release of Web Filter 3: Longhorn, a new version of the market leader for content filtering in schools. The upgrade offers new features to ease user identification, activity reporting, and safe Web browsing, as well as hundreds of other enhancements. Judges liked its user-friendly interface, flexible deployment options, and the high visibility the reporting engine allows across the network. News-O-Matic is a kid-oriented daily newspaper. It provides an exciting and engaging nonfiction experience for children, complete with valuable literacy tools for the classroom. The articles are child-appropriate and are adapted for kids at various reading levels. Every article features three reading levels for students and can also come in Spanish and French. Judges liked its weekly availability, approved of its style of presentation, and recommended the program’s digital library feature. MAP Growth measures what students know and informs what they’re ready to learn next. By dynamically adjusting to each student’s performance, MAP Growth creates a personalized assessment experience that accurately measures performance—whether a student performs on, above, or below grade level. Judges thought it was very suitable for gathering information on student skills from general growth and praised its personalized capabilities. MAP Skills is a skills mastery and progress monitoring assessment that helps teachers drill down to the specific skills each student needs to learn. Use it between MAP Growth administrations to see exactly what struggling students are missing and advanced students are ready to take on—then adjust instruction in the moment and monitor student progress. Judges approved of its suitability for school systems, and appreciated its ability to help identify struggling students. The Odysseyware curriculum is aligned with both national and state standards, including Common Core State Standards. In addition, the Odysseyware curriculum is regularly reviewed to update and confirm the relevancy and accuracy of course content. Judges praised the system’s comprehensive digital reports, the authoring tool that lets teachers insert lessons and quizzes into existing content, and liked that teachers and administrators can drill down for data from campus to student assignments. Otus was built exclusively for K-12 by a group of former educators and administrators who wanted to increase the efficiency and the effectiveness of educational technology. Otus combines three common educator tool sets: data management, assessment management, and classroom and learning management. Judges found it easy for both students and parents to use, liked the teacher’s dashboard feature and the administrator’s reporting options, and favored its unique connections to external programs that extend the platform’s usability. aimswebPlus is a powerful, proven tool that informs instruction and improves student performance, using standards-aligned reading and math measures to screen and monitor progress for grades K-8. aimswebPlus screening and progress monitoring measures can be administered in minutes, so teachers and students can return quickly to their regular schedules. Judges favored its upgrades that introduced more options to connect testing to the classroom and its thorough data reporting, covering both individual students and holistic performance. Pearson provides support in online program management to help institutions launch or expand their online degree programs, tailored services, including analytics technology to help track student data performance, and innovative digital solutions, offering effective, personalized teaching and learning solutions at the institutional, program, and student level. Judges liked its comprehensive organization, its ease of use, and the dashboards that let both students and teachers connect to everything that they need to do or see. Test of English Language Learning (TELL), is a touch screen-delivered language proficiency assessment that can be used to screen, diagnose, and progress-monitor English language learners in grades K-12. TELL enables consistent and objective scoring on four foundational skills: reading, writing, listening, and speaking, and also aids in helping students build up their skill in pronunciation, fluency, grammar, and more. Judges liked the interactivity of the apps’ videos and the automatic scoring of the assessments. WriteToLearn assesses writing and returns targeted instructional feedback within seconds, providing opportunities for students to build writing skills and develop reading comprehension while expanding their vocabulary. Features such as embedded writing activities, writing tips, and more, help scaffold the writing process. Judges loved the 39 new literature-based prompts for essay writing and a new automatic scoring feature, and they liked the personalized tools students could use to build up their writing skills and reading comprehension. Prepworks Learning Positioning System technology employs intelligent software to deliver prescriptive instruction in multiple subject areas. Similar to a GPS, Prepworks LPS locates each student on a given path and re-calculates the learner’s progress in real time, adjusting the content in every lesson and activity to meet each learner’s needs. Judges liked it for its ability to produce guaranteed results while providing personalized lessons based on said results, along with its improved organization of learning paths. Promethean ClassFlow helps teachers build and access interactive lessons from any Web browser, share lessons with other peers, and collaborate using the latest mobile and student response technology. ClassFlow also helps teachers save time in lesson development, allowing educators to better facilitate a connected classroom. Judges liked the software’s versatility in being usable on any interactive whiteboard, and liked the Desktop feature where teachers can add question sets and create tests and quizzes for assessments. Renaissance Star 360 includes interim assessments for early literacy, math, and reading (also available in Spanish), helping educators determine the best instruction to meet the needs of all students. Each assessment produces valid, reliable data and can be completed in a fraction of the time it takes to complete other benchmark and interim assessments. Judges liked the personalized reading practice and they also appreciated the availability of special reports, also featuring Spanish versions. Renaissance-U offers flexible professional learning through personalized coaching supported by self-paced tutorials and activities. This dynamic SaaS platform is consistently updated with new content. The system features expert data coaching and self-paced online tutorials and activities, helping schools effectively use Renaissance’s assessment, math, and reading solutions and the data they provide. Judges thought it was a solid product that used good methods to connect data to instruction and loved the personalized coaching it provided. Securly is a Web-filtering appliance that features Chromebook filtering, offers support for Windows, iPads, Macs, and Android/Nexus tablets, and uses natural language algorithms to audit student posts on social media such as Facebook, Twitter, and Google+, flagging activity that might be indicative of cyberbullying or self-harm. Judges loved its social media auditing feature, the secure browsing it offered, and the free Chromebook filtering that allows administrators to secure their 1-1 program for Windows. Shmoop is offering new resources like Shakespeare in Modern English and guides to famous historical texts and speeches, and their premium resources have also been upgraded, allowing students to use Shmoop’s test prep to study for a variety of standardized exams. Judges commented on Shmoop’s comprehensive selection of topics, were wowed by the upgraded, user-friendly interface, and they loved the interactive overlay feature, enabling students and teachers to annotate, draw on, and highlight most file types. StudySync is a cross-curricular, core literacy solution with hundreds of texts, dynamic video, and multimedia lessons guaranteed to inspire and advance reading, writing, critical thinking, speaking, and listening skills to prepare students for college and careers. StudySync provides digital instruction with print resources to ensure teachers can provide students a systematic path to success. Judges liked its comprehensive language arts program, its core lessons, and its other instructional reading activities like quizzes and spotlight skills. Wixie is an online publishing and creativity platform that lets students share what they know through their writing, voice, and art. The platform blends text and voice recording with original art and images. Judges liked that it features a user-friendly Web program, praised the over 500 new standards-based activities now available, and also liked the teachers’ ability to access student accounts from their dashboards, helping them differentiate assignments between classes and individuals. Turnitin Feedback Studio includes new improvements such as one-click plagiarism checking that compares student content to Internet sources, new feedback features, including allowing teachers to leave voice comments along with their summaries, and more. Judges liked its peer-to-peer collaboration capabilities, the system’s ability to calculate by percentage similarities between submitted work and online sources, as well as its grammar check feature that frees teachers up to focus on student ideas and concepts versus mechanics.